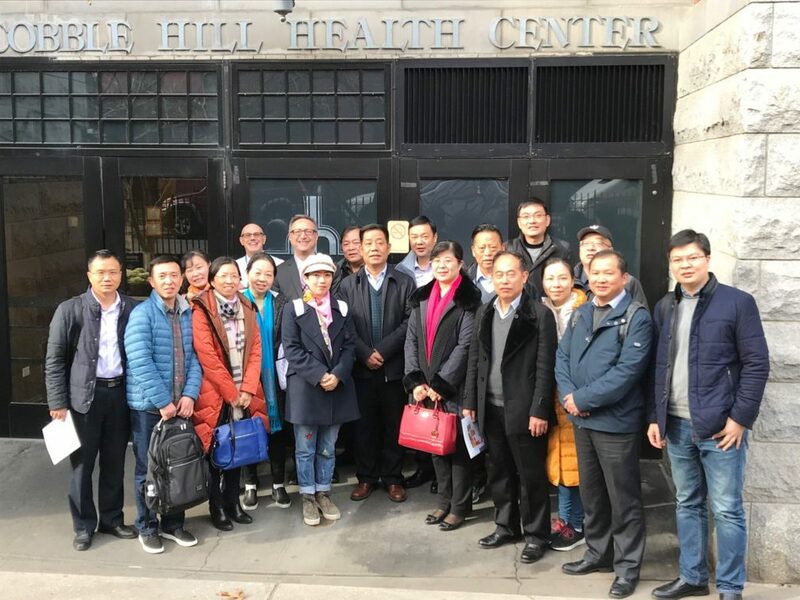 A group of physicians and administrators from China recently visited Cobble Hill Health Center (CHHC) to better understand modern delivery of long and short-term care in skilled nursing facilities and see best practices first hand. The group, which included 18 doctors and hospital administrators from hospitals throughout Hubei Province, China, spent half a day with CHHC’s CEO Tony Lewis and director of Social Work, Robert Herel, LCSW, and met members of the team throughout CHHC. As part of the visit, the Chinese group was provided with a presentation on differences between hospital and nursing home care in the U.S., highlights of services provided at CHHC and how they are delivered, including medical care, nursing care, physical therapy and occupational therapy, geriatric psychiatry and psychology, and nutrition, and an overview of the reimbursement system. The team also discussed contemporary dialysis, dementia care, palliative care, hospice, as well as a how social work addresses post-discharge challenges, such as housing issues or family needs. During the visit, the group toured CHHC’s inpatient rehabilitation facilities, therapeutic recreation program, long-term care facilities, and dementia unit. Throughout the day, CHHC’s philosophy of compassionate person-centered care was emphasized. The program concluded with an opportunity for the Chinese visitors to ask questions of the staff to obtain further information related to their individual specific areas of interest and take home new ideas for improving care. The visit was organized by the Gerontology Society of America. Pictured after the tour are (back row left) Cobble Hill Health Center’s Robert Herel, LCSW, director of Social Work and Tony Lewis, CEO (center) and members of the visiting group.